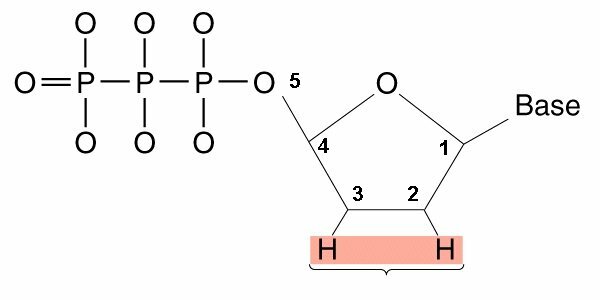 Dideoxy nucleoside triphosphates (ddNTPs) lack an -OH on the 3'-C as well as the 2'-C of the deoxyribose sugar. The 5'-C can form a phosphodiester bond with the previous nucleotide in the chain, but the 3'-C cannot form a bond with next incoming dNTP. Addition of a ddNTP during DNA replication therefore stops synthesis.